Matthew Yglesias lets us know that Kevin Hassett, co-author of Dow 36000, is out there arguing that we need to balance the budget to get ourselves out of the financial crisis. This has me thinking that it's time to drop the 'neo-' in 'neo-Hooverite'. Hassett is currently director of economic policy studies at AEI. I guess it's kind of like the Iraq War, where you can give really bad advice and still hold onto an awesome think tank job. Such states of affairs in the world are beyond my power to correct. But they're not beyond my power to satirize with Photoshop! 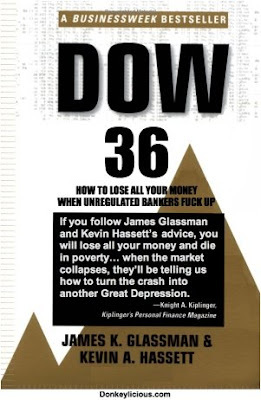 * Again, here's the original cover of Hassett and Glassman's book. If you have a blog or some other such thing, you are free to grab this as you wish. *I actually use an less feature-rich open source Mac program called Seashore. It's pretty good, and I don't know how layers work anyway. Ha - not bad. For some reason, at first cursory read, I thought you were challenging us to make our own parodies, and you inspired me in any case: here's my version.